Maca is full of Peruvian energy, endurance and toughness as it grows in the harshest climates. No wonder it was loved by warriors of Inca times. Our 4 colours of maca root, are washed, dried and milled, that’s it!. Maca, the Peruvian golden root vegetable has been enjoyed for thousands of years. During Inca Empire times, it is believed Inca warriors consumed maca for strength and endurance. Organically grown at high altitude in the Peruvian Andes, this nutritionally well balanced super root is carefully harvested, naturally open-air dried and broken into pieces. The maca pieces are then gelatinised to reduce starch content for easier digestion and absorption and to concentrate the nutrients and then, milled into a fine powder. 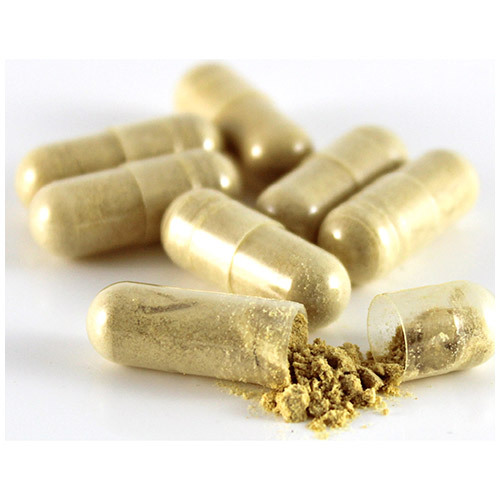 Our maca powder is encapsulated to GMP (Good Manufacturing Practice) and organic standards in the UK into vegan, vegetarian and vegetable cellulose (plant based) capsules which are certified Kosher and Halal and contain no bulking agents, fillers or binders. 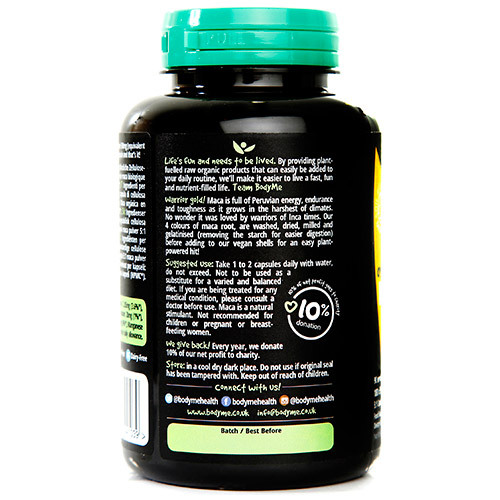 Every capsule contains 500mg of pure organic gelatinised maca root powder and nothing else. 5kg of whole maca root is used to produce 1kg of our powder meaning every 500mg capsule contains 2500mg of whole maca root (5:1 concentration ratio). Our gelatinised maca powder is a blend of four types of maca root - yellow, red, black and purple for nutirtional diversity and good balance. Every stage of the life of our maca, from growing to encapsulation is kept to strict organic and ethical standards. This ensures nothing is added or altered, keeping the nutrients in their natural state for you to benefit and enjoy with peace of mind. 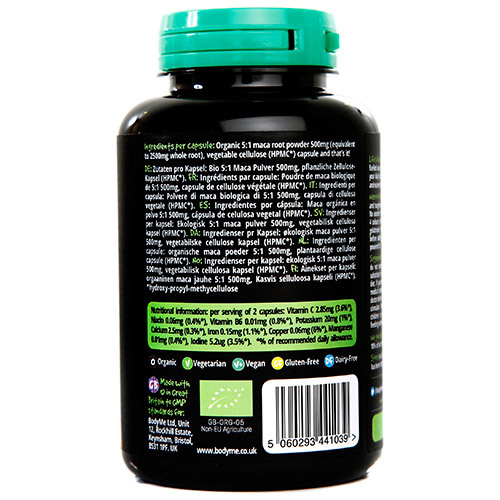 - We source only the highest quality organic superfoods. 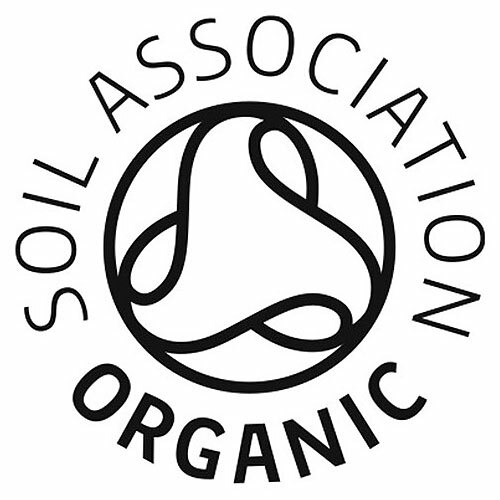 - We are licensed organic by the UK Soil Association. - We donate 20p from the sale of every pot to charity. - Our commitment to the highest customer service. - Our passion for helping people to enjoy a natural and healthy life. Organic 5:1 maca root powder 500mg, vegetable cellulose capsule (plant based). 1 capsule taken once or twice per day before a meal with water. Store in a cool dry dark place. Do not use if original seal has been tampered with. If you are being treated for any medical condition please consult a doctor before use. Not recommended for child or pregnant or breast-feeding women. Not to be used as a substitute for a varied and balanced diet. 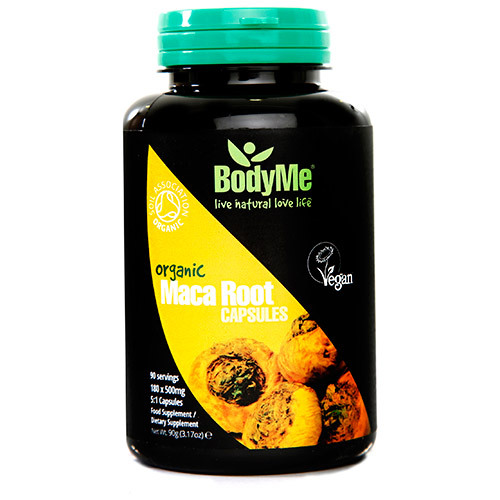 Below are reviews of BodyMe Organic Maca Root 5:1 - 180 x 500mg Capsules by bodykind customers. If you have tried this product we'd love to hear what you think so please leave a review.